The use of friction stir welding techniques (FSW) to assemble thin aluminum plates in aerospace applications brought about the need for a high-resolution, non-destructive testing technology to find and characterize the small defects that may occur when using FSW. Phased array ultrasonics has been applied to FSW with success, and is now being used for shop floor inspections. This paper will discuss phased array ultrasonics and its application to friction stir welding of thin aluminum plates. Friction stir welding (FSW) is a solid-state bonding technique, which uses the heat generated from a milling-type tool to plasticize and bond two sheets of metal. This welding technique has many advantages. No melting means less contamination. The weld material has a very fine microstructure, which has a higher tensile strength than the heat-affected zone, and possibly the parent material too. The process is controllable. FSW is very repeatable, allowing less structural conservatism (or less over design). There are also practical considerations, like low shrinkage, no porosity, no gas shielding, no finishing of the weld required. FSW was primarily developed for aluminum, particularly the high-strength alloys. It has since been adapted for steel and other materials. Conventional inspection techniques have had major difficulties in detecting some of the defects in FSWs. The FSW process produces small "lips" on the surface that makes a raster scan impossible to perform. In this application, the component itself offers further inspection challenges. The weld is over 8 meters (25 feet) long, and requires full inspection for all defects within one hour. However, the one-hour time limit poses no problem, it gives plenty of time to perform the inspection. To simulate actual conditions, a variety of plates containing deliberately embedded defects was supplied. These plates have wall thicknesses varying from 5 to 10 mm (0.200 to 0.400 in.). However, the thicker section only has a width of around 75 mm (3 in.). Due to the width of the transducer, in reality only about 50 mm (2 in.) of the surface is available for ultrasonic inspection. The weld itself, including the weld nugget and the relevant heat-affected zone, is approximately 25 mm (1 in.) wide. This 25-mm width needs to be inspected, plus the error margin from the mechanical delivery system (±5 mm), for a total of 35 mm (~1.40 in.). A sketch of the weld is shown below. Besides providing techniques that can detect the major defects, the specifications include inspecting from both sides of the weld. Thus, the challenge is to reliably inspect at multiple angles, including transverse defects, and accommodate position errors, all within the specified time frame. The weld surface is generally uniform, a feature of FSW. However, usually two weld lips about 1 mm (0.04 in.) thick remain. These lips are important enough to prevent a good contact between the surface and a hard plastic wedge. Thus, an alternative coupling mechanism is required. Complete immersion is not practical, so a local immersion technique is required. A special shoe with a water chamber is used. A circulating water system prevents water from leaking onto the part. The qualities of ultrasonic phased arrays make it most suitable solution to rapidly inspect FSW. Phased arrays use an array of elements, pulsed with different delays, to generate an ultrasonic beam. 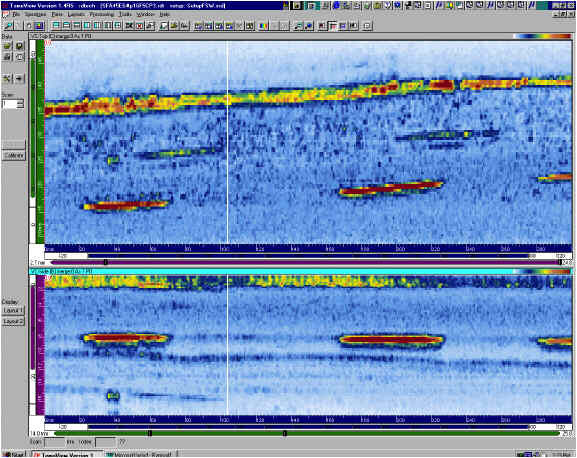 Once generated, the beam is identical to the beam generated by conventional transducers; phased arrays are merely a method of generating and receiving ultrasounds. The beams are generated and received with the use of focal laws, which define the elements to be pulsed and their delays. Software modeling programs and setup wizards are used to define the focal laws. For example, with the setup wizard, the operator defines the number of elements, the required refracted angle, the focal distance, the probe, wedge and material characteristics, and the computer calculates and displays the delays. The produced focal law is then used to generate and receive ultrasound. Different focal laws can be used to shape signal generation and reception. Even though phased array probes are custom-built, they can be separated into a number of categories: circular, circular-annular, 2D matrix, and linear. Linear arrays are the most common because they are the cheapest and most versatile. Typical arrays have up to 128 elements, but there is no actual limitation in the number of elements, except price. There are physical limitations as to the size of the elements, the minimum being about 0.15 mm. Phased arrays have big advantages over conventional UT. It is possible to change the beam angle for each pulse, thus sweeping the beam through a range of angles; this is called a sectorial or azimuthal scan. 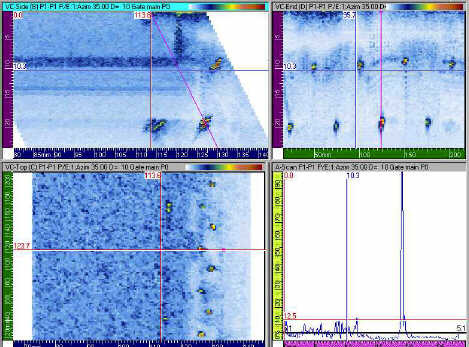 This type of scan is useful to cover a range of angles for misoriented defects. Another type of scan, called a linear scan, is particularly useful for rapid scanning with linear arrays. Here the operator defines the focal law, then repeats it sequentially along the linear array to give very rapid coverage of the material to be inspected. 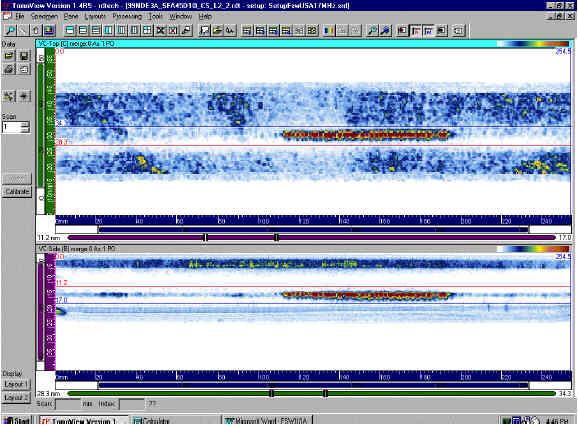 Since R/D Tech phased array system FOCUS has a pulse repetition frequency of 20 kHz, electronic scanning is much faster than the equivalent mechanical scanning. If the system has a matrix (2D) transducer, it is possible to sweep the beam from side to side, known as lateral scanning. Lateral scanning is good for detecting misoriented defects, as in FSW inspections. For the longitudinal weld inspection (i.e. detecting longitudinal defects), the beam angle is set electronically to perform the scan perpendicularly to the weld. This results in a full coverage of the weld with focused beams, which is the main advantage of phased arrays. Refraction angles from 30º SW to 70º SW are used for the investigation. 0º LW is used for the coupling check. To detect transverse and other misoriented defects, the phased array probe is tilted in order to be in the same axis as the weld. The angle chosen generates 45-degree axial shear waves in the weld. This permits linear scans across the weld, and sectorial scans across the weld from -30 degrees to +30 degrees in steps of 2.5 degrees. A raster scan is performed to optimize the detection of defects located at the weld center line. Figure 3 shows a diagram of the setup for transverse defects. The scans are displayed as a combination of images in the TomoView software. 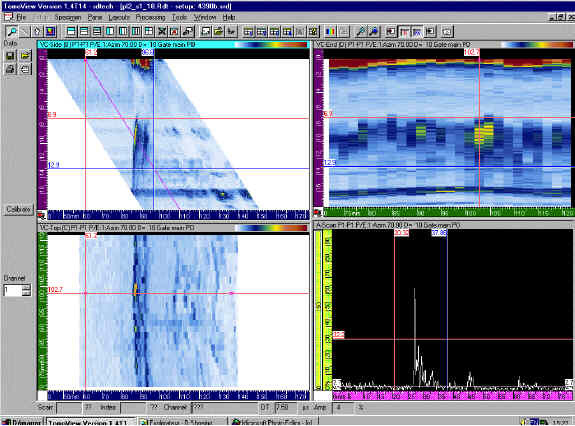 Typically, the screen is divided into four sections to show the top view (C-scan), the side view (B-scan), the end view (D-scan), and the waveform (A-scan). 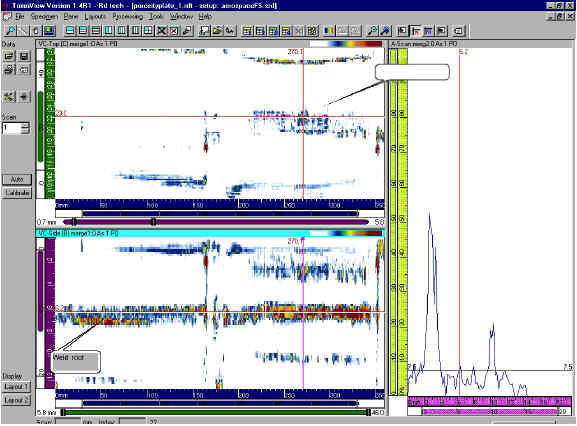 Sectorial or linear scans can also be displayed, corrected or uncorrected accordingly. 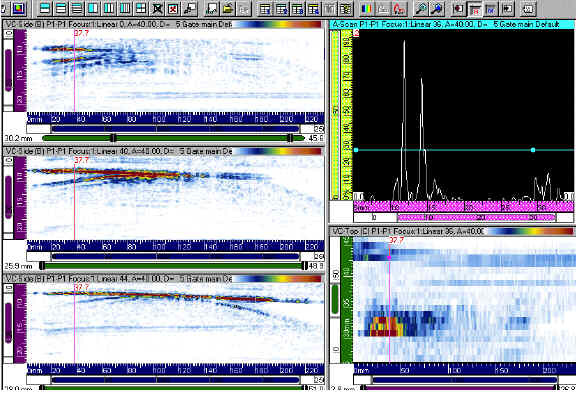 Figure 4 shows a typical multiview display of the sample inspection results. Figure 5 shows the directions of the B, C and D-scans. Calibration is essential in ultrasonics to establish repeatability and to set a pass/fail threshold. In this case, calibration scans are performed on the electro discharge machining (EDM) notches at depths of 1, 0.5, 0.25 and 0.125 mm. The two plates are positioned side by side. One plate has notches at the root position, the other at the crown. Signal amplitudes are set so that signals from the 0.5-mm deep notch are at 80% of the full screen height (FSH) at all angles. Scans of the EDM notches were performed at 35-, 40-, 45-, 50-, 55-, 60-, 65-, and 70-degree shear waves (SW) from both sides of the weld. Depending on the inspection angle, the EDM notches were detected with various precision levels. At 35 degrees, all the notches in both the weld root and crown were detected. 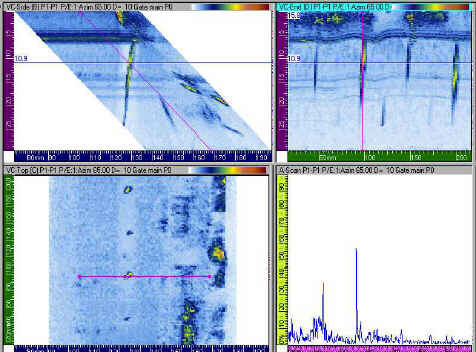 Figure 6 shows the 35-degree scan results from the lip side (one side of the sample had a lip). Similar results were obtained by scanning from the other side of the weld. The signal-to-noise ratio was about 30 dB. The 45-degree scans only detected the cracks in the weld crown because the lip obscured three of the root notches. The fourth root notch was detectable only because the lip was buffed at that location. The root notches were best detected at 65 degrees (see Figure 7). At this angle, the signal-to-noise ratio was better than 20 dB. Based on the results from these calibration plate EDM notches, the best detection capability for crown defects was obtained with 35-degree SW, and for root defects was obtained with 65-degree SW. This tight crack was undetectable with conventional ultrasonics. The plate was flat with no lips. The plate was inspected from both sides of the weld for longitudinal defects from 35- to 70-degree SW. The indication was found along the weld center line, with the maximum at three locations on one side, one location from the other. The indication was located about 2 mm (0.080 in.) above the back wall, indicating an internal defect. The echodynamics of the signal indicated a crack, and the optimum inspection angle was 70-degree SW from one side, and 65-degree SW from the other. One direction showed higher reflected amplitudes than that of the other. Figure 8 shows a typical scan. This defect was a tight 0.015-inch deep crack along the weld root. It is called a toe crack. The panel was inspected using 35- to 70-degree shear waves for longitudinal defects from both sides of the weld. Figure 9 shows the image of the defect superimposed on the weld profile. The optimum angle for detection was 35-degree SW or 40-degree SW, which differs from the tight crack results, where the best angle for detection was 65- or 70-degree SW. The signal-to-noise ratio was around 25 dB, and the echodynamics of the signal suggested a crack. The oblique defect was not detected with the longitudinal configuration at any angle. It was only detected with the skew configuration (lateral scan) using a refracted angle of 45-degree SW, and a skew angle of -20 degrees. Figure 10 shows the results obtained from the lateral scan. A transverse defect was clearly detected using lateral scans at 0 degree skew and 45 degrees refracted angle. Figure 11 shows a scan obtained from the side opposite the lip. A 6-mm thick weld without any defect at one end, and with wormholes at the other was inspected. A 45-degree SW refracted angle was used. In Figure 12, the wormholes are clearly visible on the right side of the image. They are located at 3 mm below the surface in the weld center line. Lack of penetration (LOP) 1 mm deep is clearly detected at 45 SW. The LOP in this sample is around 80 mm long and the signal-to-noise ratio is over 25 dB. Smaller size LOP can be detected. The intensity of the detection varies along the sample, suggesting that the nature of the LOP is different over the sample. 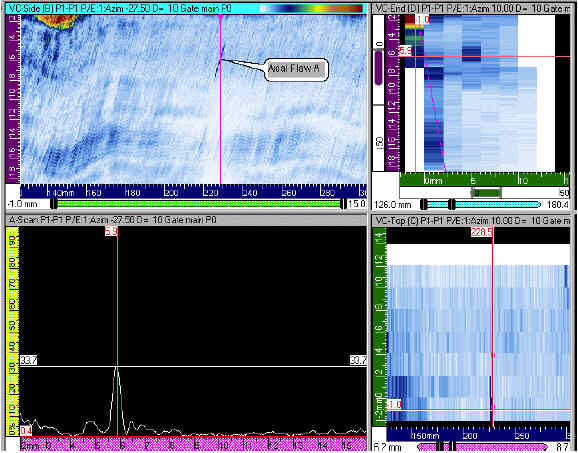 The next figure shows the detection of a faying surface defect. This indication has a half-moon shape and its axial position from the center of the weld varies. Images on the left show a longitudinal section at different distances from the weld center. The variation of the position indication is clearly illustrated. The exact cause of this defect is not well known yet. Kissing bonds generated artificially were examined. These kissing bonds are clearly detected at 45-degree SW. The exact widths of the kissing bonds examined are not known. We suspected that completely closed kissing bonds would be very difficult to detect. The detection capability limits related to the tightness of the kissing bonds are not known. This particular item will be studied by R/D Tech and major research centers in the near future. The optimum inspection angles are 35- to 40-degree SW, 60- to 70-degree SW for the root, and 35- to 40-degree SW for the crown. The probe echodynamics indicate a beam size of about 1.5 to 2 mm; this means that each scan must be performed with less than a 2-mm axial step to guarantee coverage. The physical size of the weld and the 3/8-inch platform means that the maximum angle that can be used to fully inspect the weld root is 65 degrees in pulse echo. 0-degree LW is used to perform the coupling check. This 0-degree LW can be used to achieve the profilometry of the weld. The FOCUS phased array system characteristics make it a very promising FSW inspection system. The FOCUS phased array system has detected all the defects from the submitted material. Due to the FSW lips, a raster scan is impossible. An immersion system or water chamber approach should be used with a recycling system to prevent water loss. Signal-to noise ratios are high in general. 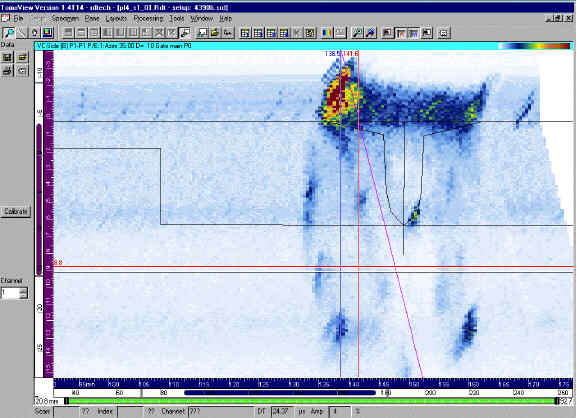 Using electronic scanning at suitable angles, phased arrays maximize the detection probability of defects. 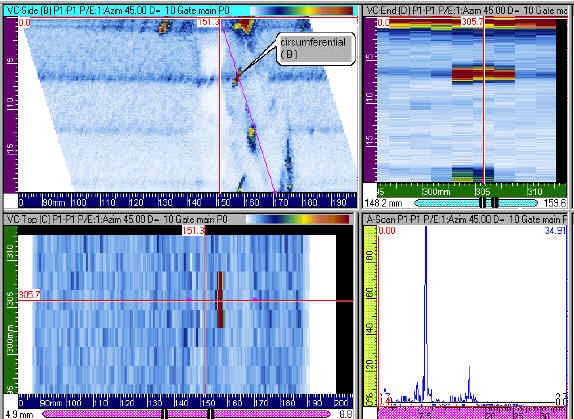 Transverse defects are detected by lateral scanning. Scanning rate is 20 kHz, which is much faster than mechanical scanning. Phased arrays eliminate the need for a second scanning axis as scanning setups are done electronically. The phased array system is used on production floor and in laboratories. To keep investigating the detection limits of ultrasonic phased arrays, especially concerning kissing bonds. The detection limits with regards to the tightness of these defects will be studied by R/D Tech and major research centers in a near future. To keep working with major FSW users to always improve the inspection method. To consider the integration of the inspection phased array head to the welding head.